The AMG 750 is a heavy loader, with a carrying capacity of 750LBS! It easily converts between 9 separate modes to suit your need accordingly. The AMG 750 will have no problem handling you biggest or smallest tasks with precision and efficiency. Conveniently folds to easily fit in any trunk, trudck bed, closet or storage area. The multi-purpose Honey-Can-Do Rolling 4-Wheel Utility Cart makes toting groceries, laundry, cleaning supplies, office supplies or picnic gear a breeze. Featuring ample storage space, this cart is not only sizeable enough to hold your belongings, but functional enough to easily navigate curbs and steps. The sturdy and strong black metal frame can handle a 50 lb. 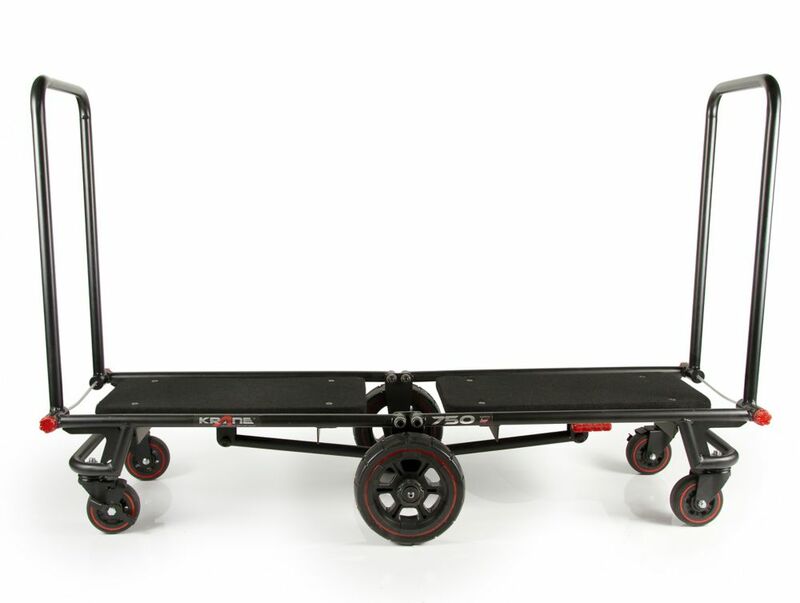 load and the non-slip rubber comfort grip and heavy-duty wheels make pushing this cart effortless and easy. Simple to store, this cart folds flat in seconds and neatly tucks away. You don't have to break your back or the bank with this all-purpose foldable cart. Perfect for toting groceries, laundry, cleaning supplies or picnic gear, this cart is sizable enough to hold numerous belongings and functional enough to easily navigate curbs and steps. Front wheels rotate a full 3600, making for a tight turning radius. This utility cart has a sturdy steel frame with a rubber comfort-grip handle to carry a maximum 150 lb. load with ease. When not in use, it folds flat in seconds and tucks away neatly. Krane AMG 750 Transforming Utility Cart The AMG 750 is a heavy loader, with a carrying capacity of 750LBS! It easily converts between 9 separate modes to suit your need accordingly. The AMG 750 will have no problem handling you biggest or smallest tasks with precision and efficiency. Conveniently folds to easily fit in any trunk, trudck bed, closet or storage area.